Did you ever see a picture and think to yourself… “THAT wants to be a SONG”? Well, that’s exacly what I thought when I saw the following picture of my friend Beth Oram’s little dog named Baby. Baby! Photo by Beth Oram Photography. It looked to me like this little puppy just wanted to be part of Santa’s team! So, Mike and I wrote the song, we recorded it one night a couple of weeks ago with some friends at Berklee. The groove is inspired by the Spin Doctors (Yeah! ), and the message for this Christmas song is about giving, helping friends, and taking steps to make your dreams come true. Our friends at Planet Sunday are hard at work on the cartoon version. The following is an “animation rough” also known as a storyboard. The finished version of this cartoon music video will be ready in time for Christmas 2011! We always like to give our fan families an inside view at what’s in the works! Enjoy the (preproduction) story of “Santa & Baby”! Thank you to everyone who came to our sold-out show at the Regent Theatre in Arlington, MA on Saturday, March 26, to celebrate the release of our new DVD, STORY SONGS & SING ALONGS. We had a great time singing along with our special guests and good friends Bob McGrath from Sesame Street and Darcel Wilson. Here is a video of our last song that day. Recorded LIVE at WERS 88.9 FM! Debbie & Friends on WERS Live! Debbie and Friends had really fun time playing LIVE in the WERS studios on March 20, with Host “Ginger Snap” of The Playground. We sang songs, told stories, and even had a special guest appearance with The Big Bad Wolf, who stars in a a number of our recordings. If you missed it, don’t worry! The following is a recording of our WERS on-air debut. Thank you, WERS The Playground and “DJ Ginger Snap”! Debbie and Friends thinks you ROCK! Here are some pictures from our time on the air! Debbie singing on WERS Live! Mike singing on WERS Live! Rory and Kevin playing on WERS Live! DJ Ginger Snap and Billy on WERS Live! 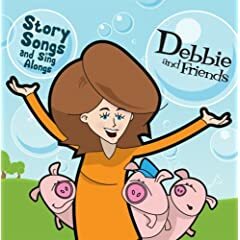 Debbie and Friends is hard at work on our new DVD to be released on March 29, 2011. On December 18, we performed a live action concert shoot for the DVD at Berklee College of Music’s CAFE 939. The following is a fun “Outtakes Video” featuring some special moments from that day. Thanks again for voting for your favorite “fairy”! As you know, the fairy Godfather won the fairy contest by popular demand, and he’s read to make his cartoon debut! Presenting Debbie and Friends’ “Cinderella” song. It’s the classic tale with a twist, including self-esteem and friendship messages for kids. Thank you to Planet Sunday for the amazing animation work! You guys are the greatest! Yesterday, the band and I had the great opportunity to make music with some of our fan families as a 4-camera crew and audio recording team captured our time together at Berklee’s Cafe 939. The videos will be part of our new DVD, scheduled to be released on March 29, 2011. We’ll have a special DVD release concert at the Regent Theatre in Arlington, MA on March 26 (mark your calendars!) Click here to order tickets. The DVD shoot was a such a fun time! My favorite moments were when all of the families were singing our songs along with us, as strongly as the band. Very special! The following are some pictures from the day. Debbie, Eric, and the kids!